Recently, the European Commission has issued the “Directive 2004/35/CE on environmental liability with regard to the prevention and remedying of environmental liability”. The Directive extends liability that usually refers to personal injuries and private property to harm where private property does not exist (e.g. biodiversity and endangered species). In these cases, problems with multiple causation and uncertain causation tend to be even more severe than for cases where solely private property is affected. Nevertheless, the otherwise very ambitious Directive remains silent about how to deal with these problems. We focus on uncertain causation and analyze second best optimal standards of proof in a model where benefits of risky activities are private information, and where the firm’s care level chosen to avoid the damage is only imperfectly observable. We derive three results: first, we characterize the factors determining the second best standards. Second, and conversely to the previous literature, high standards of proof such as proof beyond reasonable doubt can be second best optimal even though they lead to inefficiently low care levels. Third, legislators should leave discretionary power to courts which allows them to choose the standard of proof conditional on factors such as the degree of uncertainty over causation or the information quality about care levels as taken by injurers. We are very grateful to an anonymous referee for his valuable suggestions. 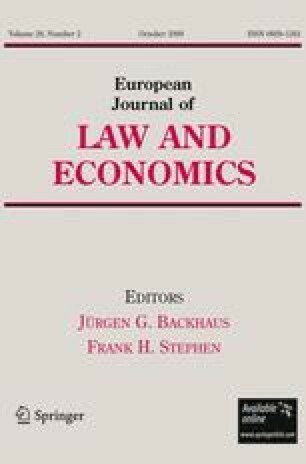 Moreover, we thank Fernando Gomez, Ariel Porat, Hans-Bernd Schäfer, Urs Schweizer, Kathy Zeiler and participants of the 2006 Meeting of the American Law and Economics Association in Berkeley for helpful comments. G. Muehlheusser gratefully acknowledges financial support from the Swiss National Science Foundation as well as the hospitality of the Management & Strategy Department at Northwestern University’s Kellogg School of Management, where part of the paper was written. European Commission. (2004). Questions and Answers Environmental Liability Directive, http://europa.eu/rapid/pressReleasesAction.do?reference=MEMO/04/78. Van Gerven, W. (Ed.) (2004). IUS commune casebooks for the common law of Europe, http://www.casebooks.eu/index.php.